The annual Film-making for Dungus workshop organised by the School of Arts and Social Sciences (SASS) took place over two Saturdays, on the 25th of March and the 15th of April. 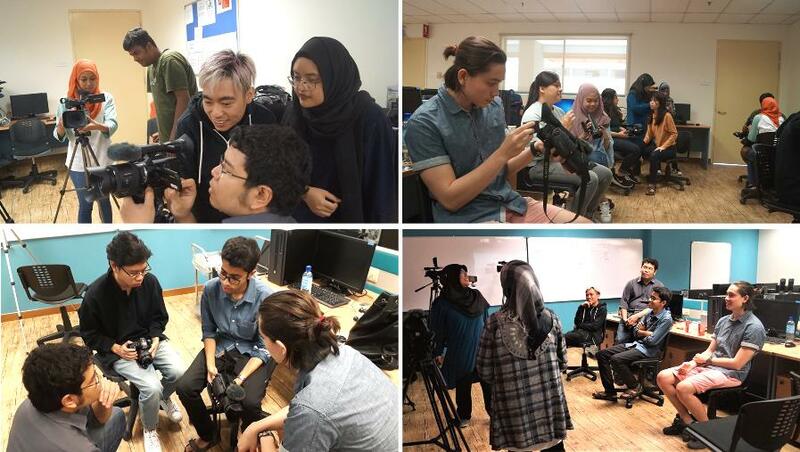 The two-part workshop was facilitated by Fikri Jermadi a writer, academic and experienced film-maker at Monash Malaysia and Jakarta International College. He is also an alumnus of the SASS. The first part focused on the principles of film-making. Students were introduced to basic concepts and theories required to understand and make a film. He discussed the process of developing ideas from inspiration and Mise-en-Shot which is camerawork and techniques for specific effects. Theory met praxis when the participants had the opportunity to test out actual equipment which included video cameras, stage lighting. The second part focused on logistical matters and post-production. This included the more technical aspects of the audio work and editing process as well as the pragmatic issues of scheduling shooting times to ensure time efficiency and budget adherence. Marketing and promotion were also touched on when Fikri gave a rundown on making press release kits. The media can’t promote our films if they don’t have important information of it. In between the first and second part of the workshop, we were encouraged to produce a film ourselves and that we did! A group of us produced a short film entitled “Gaze”, which can be accessed through this link: https://www.youtube.com/watch?v=H3kKPRIoo88. Young Tuck, Christol Fong and Alya Zuhalka came up with the story idea which was inspired by Jean-Paul Sartre’s theories on the dynamics of gaze and objectification. The silent film employed the use of subtle expressions, often to dramatic and ironic effect. Fikri praised the film for its quality especially in the timeframe it was produced in (half a day!) while giving critical feedback especially in the choice of background music. It could have taken a more sombre route to represent the intense mood of the scenes. The crew members reflected on their experiences and felt that team management and equal representation was lacking. Fikri advised that filmmaking is a purely collaborative process; teamwork makes or breaks productions so it is something that needs to be worked on. All in all, the workshop was effective in teaching basic filmmaking. It’s a good opportunity to learn basic techniques from an experienced filmmaker, apply what you have learned, and have your work critiqued. You also have access to professional filmmaking equipment provided on loan by the SASS as well as a team of likeminded students who are as as eager and willing as you to produce something amazing.